The latest update to Niantic’s much-loved and oft-maligned mobile game, Pokémon Go, has arrived. Front and center is a new feature that promises to let you set a Poké buddy, so you can walk and earn candies. This is for those Pokémon that appear so rarely, that evolving them seems unlikely or left to chance. Now, you can wrest a bit more control out of the process. It works the same way trainers hatch eggs: as you walk, you accrue kilometers and after a certain number of kilometers, your buddy Pokémon “finds” a candy. To set a buddy, first open your profile screen and tap the three lines in bottom-right corner, much the same way you customize your avatar and access your journal. Now, there’s a new “Buddy” option. 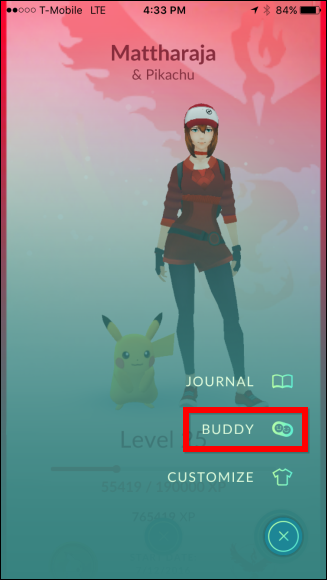 When you tap the Buddy button, you will be able to pick any Pokémon from your Poké-inventory. Once you have selected a buddy, your choice will be confirmed. 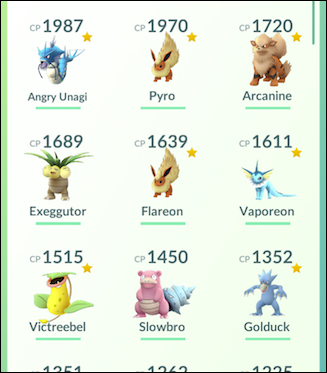 Whenever you have a buddy, the buddy symbol will appear at the top of that Pokémon’s stat screen. You can check on your progress at any time by opening your profile screen and tapping on your avatar. 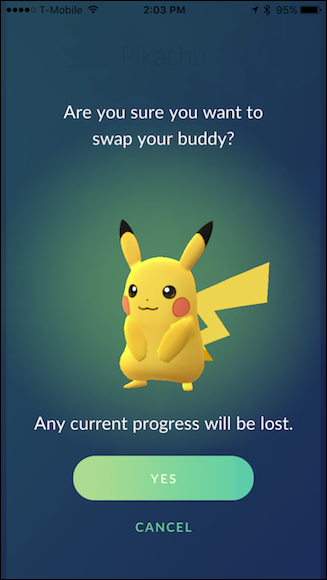 To change your buddy to another Pokémon, tap the swap arrow icon in the lower-right corner. When you change buddies, any progress you’ve earned with the current one will be lost, so it’s best to do so right after you earn your latest candy. Whenever you earn a candy, you’ll see a notification. Finally, Pikachu is earning his keep! 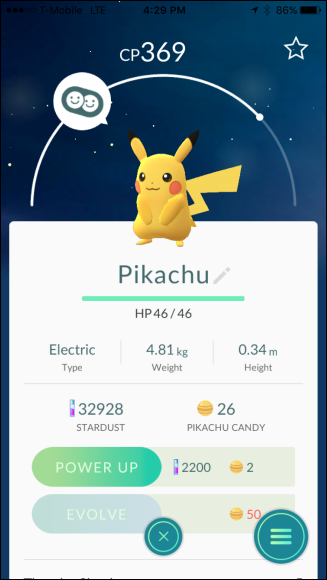 One curious note, if you’ve buddied up with Pikachu, he’ll walk by your side until he collects 10 candies, then move to your shoulder. Pikachu, always the stubborn one. Pikachu is the only one who does this. For more information as to how your Pokémon will accompany you, check out this helpful list of Poké positions. 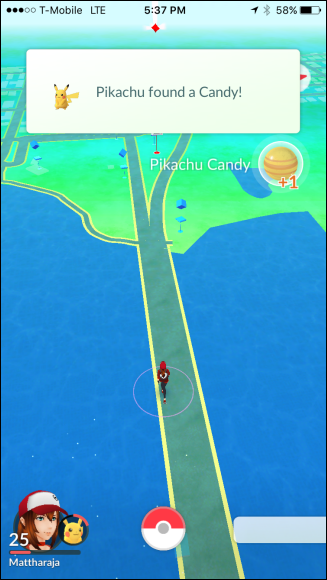 How Long Do You Have to Walk to Earn Candy? So the real question is: how many candies do Pokémon earn and how far do you have to walk? The distance you have to walk with your buddy is based on from what kind of egg it hatches. Pokémon hatched from 2km eggs require 1km of walking to earn a candy, Pokémon hatched from 5km eggs require 3km, those hatched from 10km eggs earn a candy after 5km. For example, Pikachu hatches from a 2km egg (1km walking), Charmandar hatches from a 5km (3km), and Jynx hatches from a 10km egg (5km). If you’re not sure who came from what, check out this tool from The Silph Road. 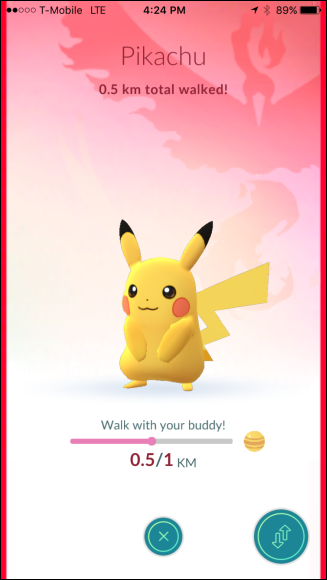 Click the “Buddies” button, and you’ll see which Pokémon require what distances. As we stated at the beginning, earning candies works just like hatching eggs, so it updates much the same way (slowly). 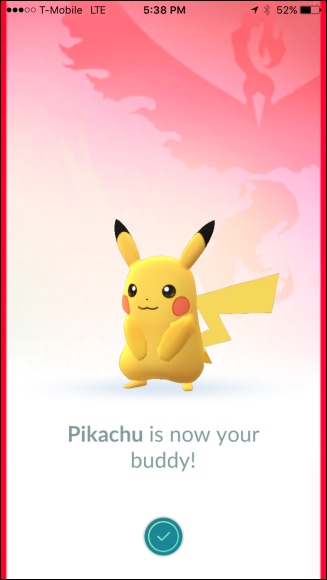 Thankfully however, unlike hatching eggs, if you walk beyond the required distance before the app updates your progress, you’ll earn credit toward the next piece of candy. For example, you walk 1.2km when you only need 1km, your buddy will be credited with that additional 0.2km. 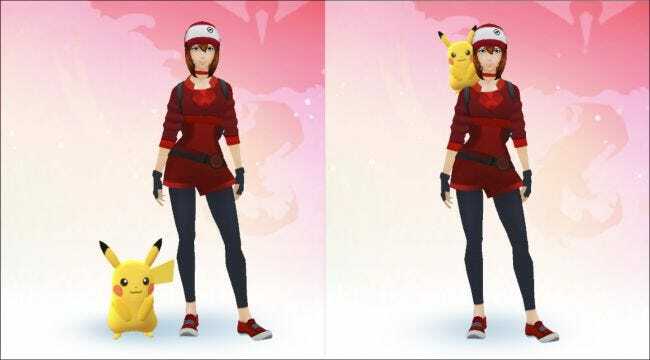 Pokémon Go’s buddy system should hopefully alleviate some of the gripes seasoned trainers have with the dearth of certain Pokémon appearing in their area, though we should emphasize that you actually need to have caught at least one representative Pokémon, and have it in your inventory. Of course, this shouldn’t be a problem with Pidgeys and Rattatas.